Developing a daily meditation practice is, without doubt, one of the best things you could do for yourself. But let’s face it – it’s also one of the hardest things to do. In a world the idolises being busy and where life only gets faster, sitting quietly can be a daunting task for many people. But let’s not lose heart! Given the immense mental, emotional and physical benefits of this practice, it’s worth a try. Here are 9 ways that can help you root yourself in the practice of meditation. Meditation is something extremely personal, and is therefore meant to be taken at your own pace. If an hour is too much for you, feel free to set your own time. Even beginning with as little as just 10 minutes is a great head start. And on days when you’re busy, ill, or plain unmotivated, you could also do it for just 5. Something is always better than nothing! The key is finding your pace, and then taking it upwards from there. 2. Surround Yourself With Inspiration. There are tons of videos, songs, books, and pictures that can guide and encourage you along your meditation journey. Reach out to them and surround yourself with this positivity. This way, your difficulties will not seem exclusive to you. You can find the answers and solutions you need in these sources of inspiration. Be around people that support and cheer you along your path. This will propel you forward! 3. Establish A Time Routine. Routine can be a powerful thing, since the body learns triggers. Pick any time of the day and commit to meditating during that slot. In a matter of months or maybe even a week, you’ll find your body and mind automatically into the zone during your chosen time of the day. 4. Create Your Very Own Sweet Spot. Just like having a regular time, practising at the same spot can help naturally enter your meditation zone. This can be a place in your home, or anywhere outside. Perhaps on a park bench or by a pond. The only two conditions? This spot should be silent. And it should be easily accessible at most times of the day. Picking a spot in your room might work excellently – you can create wonderful ambience with images, incense, pillows, and lighting. Meditating with a group is an extremely easy way to ensure that you practise everyday. 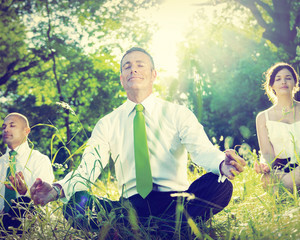 Many groups have leaders that guide meditators through the routine. Connecting with other meditators can be both motivating and socially rewarding. And pretty much all you have to do is turn up! 6. Club It With Exercise. Exercise and yoga are excellent tools to bring you into the present moment. This works as preparation for meditation. Go for a walk, swim, or best – practise a relaxing yoga sequence. This releases stress hormones and puts you in a much better state to begin your meditation session. 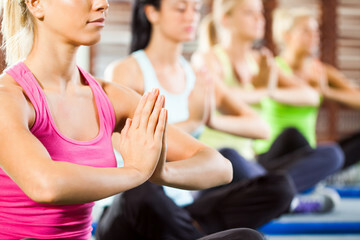 ALSO READ: What Are The 3 Main Differences Between Fitness And Yoga? 7. Write About The Benefits. Have you ever considered maintaining a meditation diary? Once you being to experience the profound benefits of meditation, it’s easy to forget them in a few weeks. Instead of letting these beautiful memories slip away, write about them in a book. On days when you feel hopeless and unmotivated, you can read about the positive experiences and find the strength to keep going. As a beginner, it’s easy to lose heart. There will be days when your mind is flooded with distractions and you simply cannot concentrate. But remember that trying is what ultimately matters. With daily practice, you are bound to calm your mind and drift into meditation. This can take months or even years, but progress is certain and it’s worth the effort. Drop judgment and simply give it your best shot. You will soon find that you are making progress. Another easy way to build your daily meditation practice is picking a partner. The best thing is that you don’t even have to be in the same place – you can both meditate individually at home during the same time. The benefit is that with a partner, you can discuss your difficulties, motivate each other, and overcome problems together. Have you tried any of these techniques to build your daily meditation practice? Did they work? Go ahead and share your thoughts or questions with us in the comments section. This is really helpful in meditating. Meditation help ease stress and helps in mind development and envisioning for the future.